In addition to the events below, we are open Saturdays for sales and sampling from 2:00 to 6:00 pm. Beer is available for purchase by the glass or to go. Open House Hours: 2:00-6:00 pm. Free guided tour and samples (begins approximately 3:00 pm). No reservations required. We have only four guided tour open houses this year that coincide with our special seasonal releases. Check Facebook, or give the brewery a call for info on these and other special events. 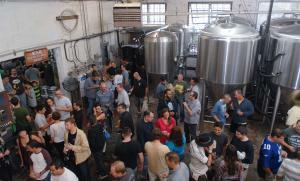 Thanks to a new law, we can host private special events at our brewery. Interested parties, please call 973.838.7400 for details. The tasting room is open on Saturdays from 2:00 to 6:00 PM for sampling and sales. Tours may be subject to cancellation, please call or check our Facebook page to confirm.